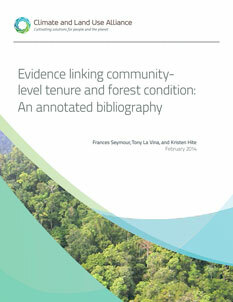 This annotated bibliography provides evidence that community tenure over forests can result in more forest cover and more species-rich forests, less deforestation and degradation, and fewer fires than some other approaches to protecting forests. These beneficial forest outcomes are more likely if communities are “traditional” or have a long-term relationship with their natural resources, if the forest provides them with some livelihood options, and if community forest rights are secure and enforced (i.e., the risks of alienation low). A key part of the Climate and Land Use Alliance’s work is to increase the recognition of indigenous peoples’ and rural communities’ rights, based on the hypothesis that strengthened community tenure leads to better outcomes for forests. This assessment has helped us better understand the empirical basis for that hypothesis. We encourage policymakers to recognize and act upon this evidence by working to strengthen community tenure and the enabling conditions that can help translate tenure into positive outcomes for forests and the people who depend on them.